Prime minister Narendra Modi visited Mandi district in Himachal Pradesh first time after 2014 election. Modi inaugurated three power projects in Himachal Pradesh. He also praised Indian army and said what Israel used to do in past , Indian army have done exactly that. PM Narendra Modi said in Parivartan rally that "Dhumal ji was asking that central government is giving so much money to state government Atleast central government should question state government" but now people of Himachal will question state government of Himachal Pradesh. Narendra Modi also said that earlier central government have given 21 crore rupees to Himachal government but after our government have given more than 72 crore rupees to state government. Modi ensured people of Himachal Pradesh that in coming 3 years poor families will get free gas connection. 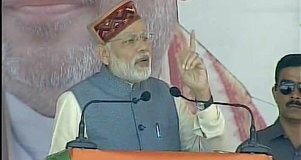 Prime minister Narendra Modi said Himachal Pradesh people used to say former bjp CM as chief minister of water and Dhumal as chief minister of roads. Narendra Modi said there chief minister have invested their life in serving state but present CM Virbhadra Singh is serving himself. Pm Modi said when he was campaigning for 2014 general election he was not aware that he have to open Department of Archaeology . He was talking about pending projects from last 35 years. - PM Modi said there was a project in 1981 , Nangalbandh talvada railway , which was in 1981 of around 34 crores and today due to criminal negligence this project is of 2100 crore rupees. - If this project would have completed at that time , there would have not that much loss of money of people. But most of projects are limited to papers and foundation stone. - PM Modi said Himachal have lot off scope in tourism , and whenever we have got chance to serve state we have served well.